ESB CREWS WILL work through the weekend to restore power to nearly 60,000 homes affected by this week’s storms. ESB is updating estimated restoration times for customers as additional information is gathered about the nature of faults. Customers without power should check for updates here or telephone 1850 372 999 and have their MPRN available to access recorded information specific to their location. Updates will also be communicated via local radio. ESB is also advising customers that all those involved in the clean up operation, especially if clearing trees or timber or other debris, should be especially careful to avoid overhead lines and fallen wires. 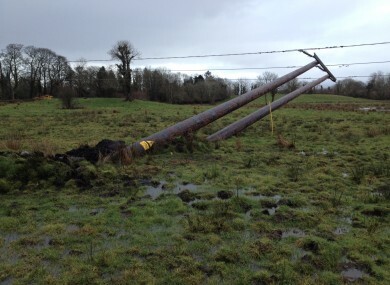 Following the week’s storms, one of the worst storms to on record to hit Ireland, over 8,000 faults have been recorded across the electricity network. If customers have information on network faults that pose a risk to the public, they should contact 1850 372 999. Email “ESB crews working to restore power”. Feedback on “ESB crews working to restore power”.